It literally happened overnight. One day I had a good-sized but innocuously green bud nestled down among the leaves and the next there was this orange-yellow blossom nudging it’s way through. I was thrilled. Then it opened up, closed back up, and fell off. But the next day I had another! And then that one opened up, twisted it petals closed, and dropped off as well. Okay, I thought. Blossoms are supposed to mean fruit. If these guys keep dropping off like this, how am I ever going to get any zucchini up in here? So I did what I always do when I’m confuzzled. I googled. 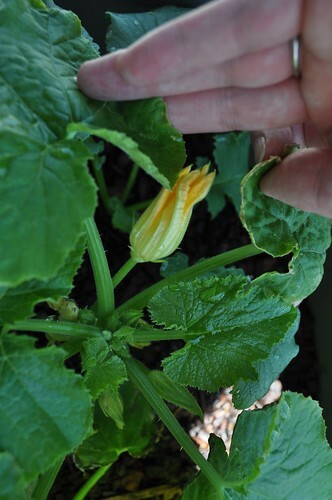 I quickly learned that, like many things in life, there are two different types of zucchini blossoms: male & female. 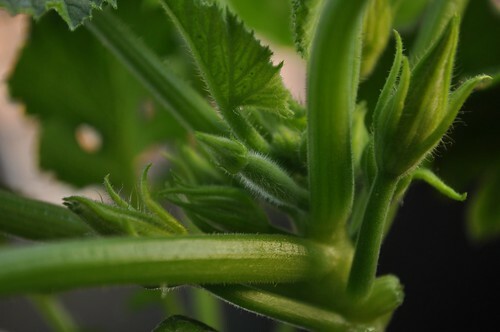 Those short-lived suckers on the spindly stems had been male blossoms. 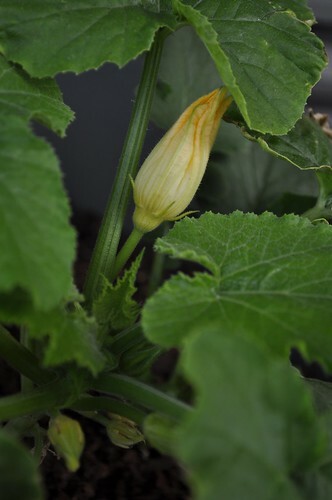 Female blossoms, on the other hand, arrive appropriately on the end of a thick, voluptuous stem. This apparently “thick stem” is actually the beginnings of fruit. Armed with this new knowledge, I began searching every day for the beginnings of a lady blossom. And I didn’t have to search for long. Now I just need to wait for her to open up (there’s actually a second one one peeking out now! ), make sure she gets a little action from one of those eager guys, and we should have ourselves some veggies. And judging by what I saw this morning, she’ll have her pick of the pollen. On a serious, reflective note: Having a garden has been a constant education, and this is just one of so many interesting things I wouldn’t have known about my food otherwise. It’s fun to really know how it all works and it makes me appreciate vegetables in a whole new way. Hi there, I came across your site through a friend and wanted to tell you that I just adore your site; the simplicity and pictures. My mom and I planted various vegetable seeds in several pots early in Spring this year.As the months flew by, we got excited by the growth of our efforts. So far the herbs are in abundance. 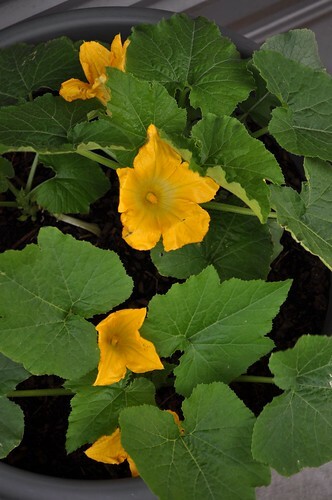 The vegetable plants are taking some time…hoping to get some results before the sunny weather disappears. Keep up the good work!